For this entry in my series, I’ve decided, by request from a reader, to look at Cordy Glenn. He wanted to know if the Bills hit a home run with a left tackle chosen in the second round. Well… why don’t we check it out? This entry will be a bit more dumbed-down than the last two, mostly because offensive line play is difficult to put into words, and I’m not looking for anything specific with Cordy Glenn, I’m just trying to evaluate his play overall and his prospects for the future. So this is a general look at two specific games Pro Football Focus said were fairly bad for Glenn. As with the last two writeups, I’ve picked certain plays out of the many I’ve watched to show something that stands out to me with the player in particular. I wanted to see how Glenn dropped back from his stance. Does he kick back well? Overall, I find he has extremely good footwork– in fact, none of the flaws or mistakes I saw in him involved footwork. That’s a very good thing going forward. Having to correct footwork can be impossible, and usually at least very hard (you can look at Vernon Davis as an example of a player who was able to correct his footwork, but only after a long time and with lots of work and coaching). On this play, he is going up against a non-contact speed rush, which is ever-so-popular in the NFL today. This happens a few steps from the line of scrimmage; we see a deep kick back from him, and he is still in a very good position to attack. 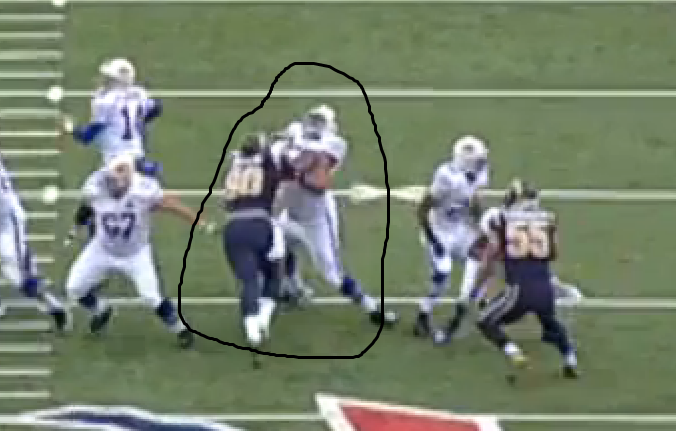 I will note this problem: his hands are at his waist here; you want to see a pass-blocking lineman keep his hands up. His stance should be almost like a boxer’s, where the player’s hands are almost at his face, so he can attack more quickly. And the defensive end actually is able to get his hands on him, which is a negative, but Glenn is strong and keeps with him, a solid block. This play ends up being a fairly big negative for Glenn. I’ll explain what is going on. Glenn is on the far right and is engaged with the DE. But the defensive linemen are running a twist stunt. 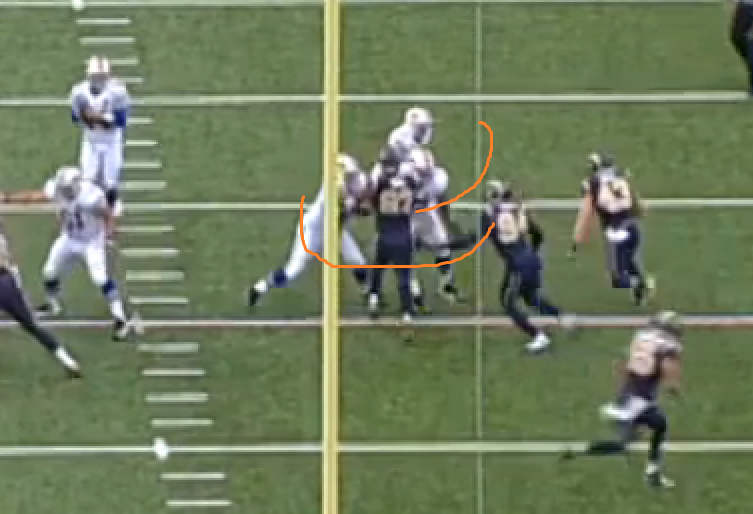 The DE is trying to drag Glenn with him, so the DT can get a free run at the QB. Glenn takes the bait; he rides down with the DE and doesn’t even get a hand on the DT. The defensive tackle ends up getting a free hit on Fitzpatrick. What makes the play poor is his lack of recognition as to what the defense is doing. The block he throws on the DE is good, at least, but a left tackle has to recognize the twist and sit in his pass protection area. This is a bad play. 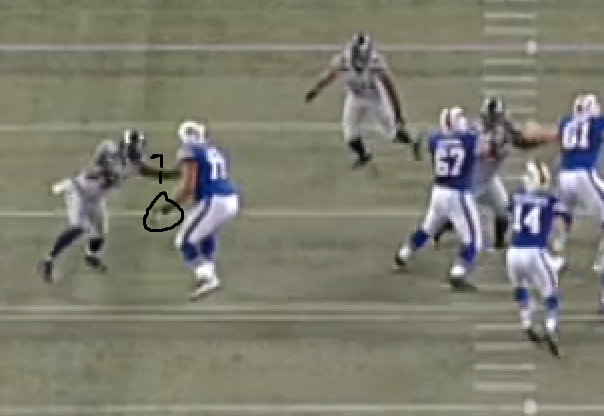 Glenn is the middle player in that cluster of three Bills (indicated by my Paint notes). Again we are seeing a defensive twist. This twist works in the opposite direction, where the DT leaves and the DE cuts inside. Nevertheless, Glenn has to react to it. This time, he clearly sits down in his pass protection area and swallows up this DT. The guard, for the most part, does a good job of picking up the DE. What I especially like about this play is that you can clearly see the separation the Glenn has created between the defender and himself. This is a 100% win for him, and those are so very rare in the NFL. A very nice play from Glenn. I’d like to look at this play because we see something a little different than the previous play: Glenn engaging with a rusher who attempts to cross his face. 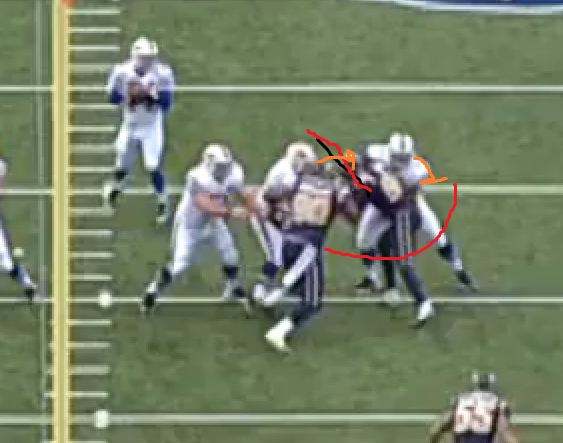 The DE tries to make a quick stutter to the outside and follow with a “rip” move underneath, and Glenn reacts nicely. I’ve said in the past that OT/DE battles are chess, and winning them is about being a step ahead of your opponent and knowing the moves he can throw at you. Glenn recognizes what’s going on and reacts perfectly. The only negatives I see here are his pad level– it’s just too high for initial contact– and that defender has gotten somewhat into Glenn’s body. I just praised Glenn for his ability to keep separation; that has to continue on every play. Like I noted above, I watched two full games from Glenn, against the Rams and the Seahawks. These were back to back weeks, PFF’s lowest graded weeks for him, against two very good and very confusing defenses. This play is from the Seattle game. I want to note his hands again: look at how low they are compared to the defenders’. Glenn is a mauler who prefers to win battles with brute force; you can tell this just by how he plays with his hands. He has to be taught to keep his hands up high (if for nothing else but to defend himself if he ever gets into a bar fight). Otherwise, this is another speed rush, and his footwork on the kickback is very solid. 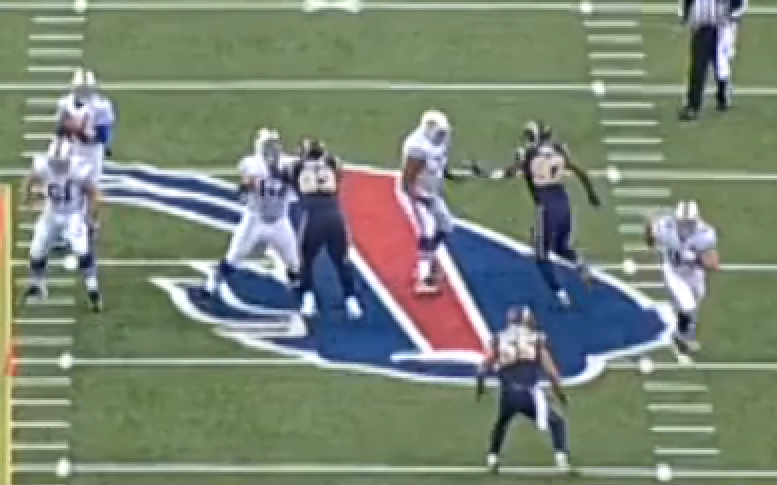 Again, his body is in a perfect spot to take on this rushing defender. I’m seeing his footwork so far as a big positive. Overall, Glenn is inconsistent. In the run game Buffalo, didn’t run behind him too much, and when they did, he was part of a double-team at the point of attack. That could just be part of the Bills’ scheme to double at the point, but I would have liked to see a run behind him where he was left to block one-on-one. 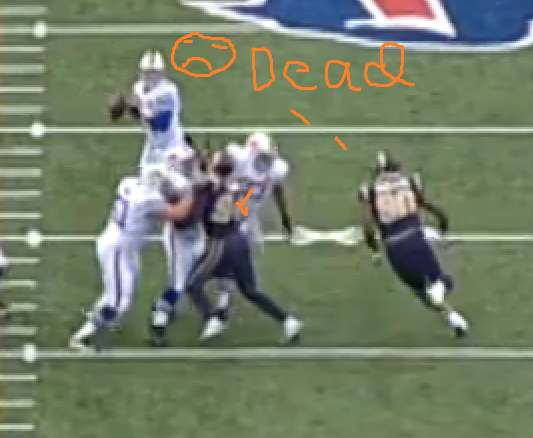 The Bills run a man-blocking scheme (as opposed to zone blocking), so that doesn’t happen as often. With that said, I never did see him get beat in the run game, and he gets to the second level fairly well. He makes a nice block on a linebacker on a reverse, a very promising play from him. And again, the fact that his footwork is solid is also promising. His hand placement needs work, and he does tend to drop his head a bit on contact, something the better pass rushers can take advantage of in that split second to win the one-on-one battle. I think for a rookie, though, he showed enough flashes in these “two awful games” (oh, PFF) that there may very well be something here. I think after more playing time and an offseason with the team, he will recognize those line stunts a little sooner and not get beaten by them as much. (It happens a few times in the games I watched, but he recovers nicely on some of them; the one I showed here was by far the worst). Glenn is most definitely an interesting prospect to watch. Is he the next Jason Peters? Probably not, but they very well might have something good here at left tackle, which would be a solid attraction for an incoming QB (and would help the development of a rookie considerably, should the Bills take one).